The most important class of these are aqueous interfaces, which are ubiquitous in biology, environmental/atmospheric chemistry, and many areas of technology (e.g., electrochemistry). The hydrogen bonding network underlies most of the important and unique properties of water. Our research aims to understand how the interface influences the structure and dynamics of the of the aqueous H-bonds. 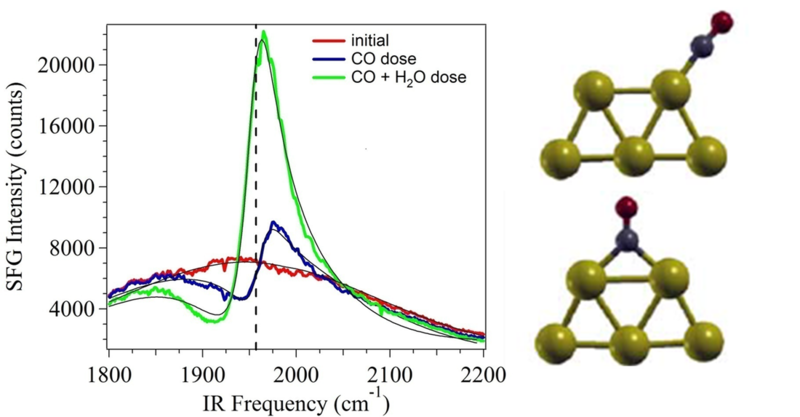 We utilize both frequency- and time-domain vibrational spectroscopy of small probe molecules and/or the OH-stretch of water itself to study rotational, vibrational, and H-bond switching dynamics, and systematically investigate how they are affected by the chemical composition and electrostatics of interfaces. Molecularly ordered monolayers and thin films are emerging as the base materials for nano- and bio-technologies and molecular electronics. The ‘tailored’ surface materials under investigation include: Self-Assembled Monolayers (SAMs), Langmuir-Blodgett monolayers, polymer surfaces, and functionalized surfaces used, e.g., for photoswitching and cell adhesion. We study details of molecular orientation, conformation, packing, dynamics and relaxation, and surface functionalization chemistry at these surfaces. We also apply nonlinear spectroscopy to study surfaces and interfaces of nanostructures. A common motif in many emerging nanotechnology applications involves nanostructures covered with chemi- or physisorbed organic molecules which perform the desired physical, chemical, or biological function. Interesting new effects arise when the characteristic size of the nanostructure approaches the molecular scale. The ever growing demand for cost-effective renewable energy sources and the promise of organic solar cell as an alternative to fossil fuels have necessitated a better understanding of the photoexcitation dynamics and carrier generation mechanisms in these devices. The active layer of organic photovoltaics (OPVs) generally consists of a blend of an electron donating material (D) and an electron accepting material (A). Light absorption in an OPV results in the generation of a molecular excited state (bound electron-hole pair, exciton) that must diffuse to the D/A interface in order to get separated. The efficiency of exciton dissociation, subsequent free carrier generation and rate of carrier recombination at the D/A junctions are intimately related to the intramolecular structure (conformation of large/flexible oligomers, polymers as well as small molecules used in OPVs) and intermolecular organization (packing, intermolecular distance, relative orientation, long-range order) of the organic materials near the interface. The goals of this program are (1) to investigate molecular orientation and conformation of polymeric and small molecule organic materials at buried interfaces and (2) understand the the energetics and coupling of the surface electronic states, which in turn govern the rate of charge separation and overall OPV efficiency. Photocatalytic processes on semiconductor surfaces are important in a number of industrial and environmental problems, including chemical synthesis, carbon remediation, and fuel production, and are used in applications such as oxidation of pollutants and self-cleaning surfaces. Combining these photocatalytic semiconductors with plasmonic metallic nanostructures has demonstrated significantly enhanced catalytic activity and, at the same time, extended coverage of the solar spectrum. The fundamental basis for enhancement is a topic of some debate among various research groups. We aim to obtain a fundamental understanding of the plasmon enhancement mechanism, active sites, surface-adsorbed intermediates, and overall reaction mechanisms involved in plasmonically enhanced photocatalytic conversion of CO2 and water into hydrocarbon fuels, as well as hydrogen dissociation. We utilize surface-selective vibrational sum frequency generation (VSFG) to identify the adsorbed intermediate species and the photocatalytically active sites on the plasmonic substrates. 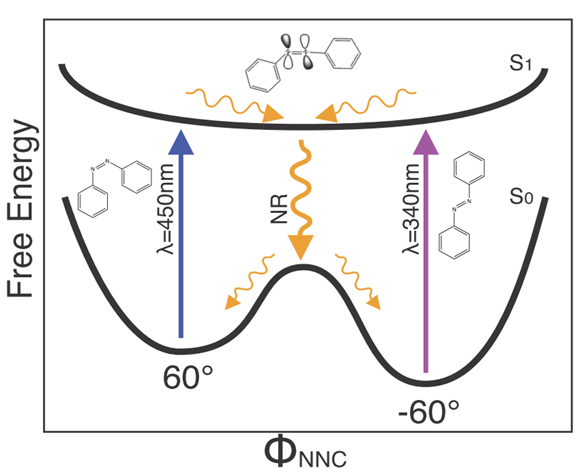 A class of versatile photoswitchable molecular devices is based on surface functionalization with azobenzens. Incident light induces reversible switching between the trans and cis conformations of the azobenzene. The light induced changes on azobenzene monolayers have been applied to a variety of devices including optical information storage, controllable wettable surfaces, liquid crystal alignment, and molecular electronic switches. These applications all rely on either the electrical, mechanical, or optical property changes upon isomerization between the cis and trans isomers of the azobenzene. To improve these photoactive surfaces and devices, it is important to characterize the molecular organization and understand critical factors affecting isomerization such as packing, steric effects, and transition kinetics. We have proposed a novel synthetic route using simple protection chemistry to form azobenzene functionalized SAMs on gold, and aim to study of the molecular order, orientation, and conformation in these self-assembled monolayers (SAMs). 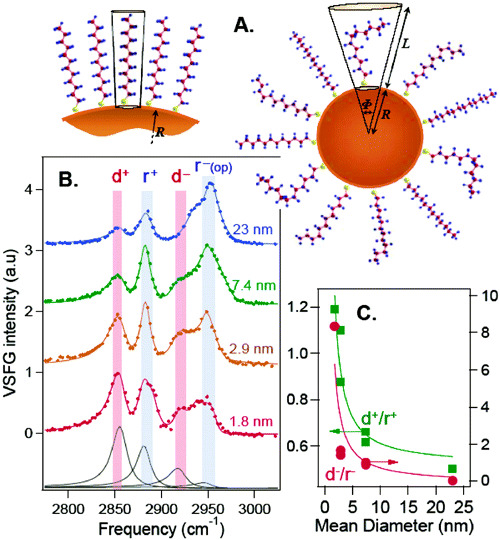 We use VSFG to characterize their vibrational modes, molecular orientation, and photoisomerization kinetics.